It seems a relatively simple question and one would suppose the answer to be a resounding ‘yes!’. If – as a society – we do not accept this hypothesis then surely the whole – virtually worldwide – phenomenon of exams would be drawn into question. However, when one begins to dissect this concept then it would seem that the answer was a rather discomforting ‘no’. Take this rather simple example. Imagine you are at work – or that you are working in any industry for that matter – and your superior poses the following challenge when you arrive at work. If your boss was to propose such a task to you, if you weren’t straight on the phone to your union then at least you would be searching for another job, wouldn’t you? I will admit that there are some professions where this type of task might be a necessity in rare circumstances as in the cases of surgery or air-traffic controlling. However, these are by no means regular or universal circumstances. Moreover, history has thought us over a wide-variety of circumstances that collaboration and the sharing of knowledge has lead to the greatest degree of progress in society. I don’t feel the need to justify this claim as it has been proven numerous times across many disciplines. 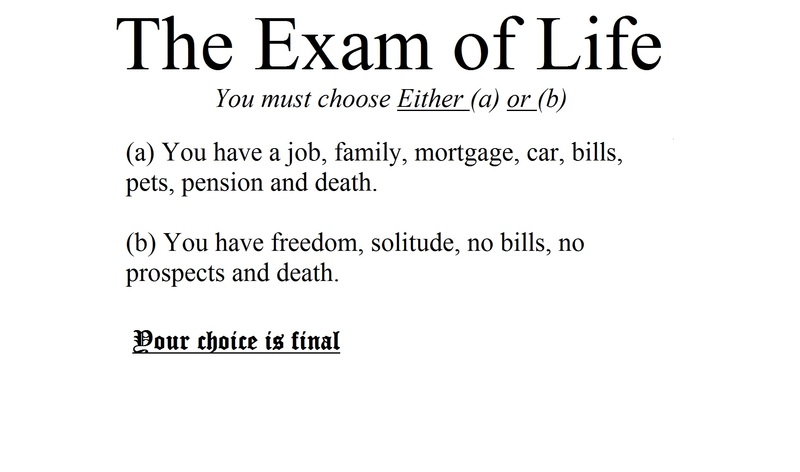 So, if life is not an exam then why must we assume them to be the most central part of education? It seems clear that the reason for their persistence is that they are designed to prevent plagiarism and the sadly – all too real – assumption that parents or teachers might otherwise bias the students progress and natural abilities through assistance or prejudice. That said, we do not assume the same issues at university level or the real world. The fact is that life is a series of varied challenges that one is faced with over time. One needs the skills and sense to ask for assistance where needed and correct one’s behaviour accordingly. Therefore, would it not make more sense for us to remove the out-dated examinations in favour of a more relevant, and regulated, continuous assessment model? I believe the answer is too obvious to state.